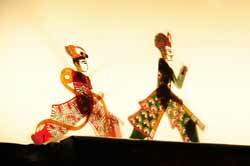 The traditional performance art of shadow puppetry can be dated back to the Han dynasty. It is an art form that remains relatively unchanged, with performances that combine singing, puppetry and leather sculpture. Shadow puppet troupes were more customary and highly revered in the 1950s and 60s. At that time it was the most accessible form of public entertainment, with temples using them in ceremonies to honor the gods. Performances would begin with puppeteers placing their leather puppets against a silkscreen and with the snap of the lights, the elegant puppet silhouettes would burst into song. Today, one of the most reputable troupes in Kaohsiung is Mituo district's fifty-year-old, award-winning, Fu Hsing Ko Shadow Puppet Troupe. Mr. Syu Fujhu (the troupe's current chief puppeteer) describes many intricate details of puppeteer training. Puppeteers must undergo an extensive and arduous training process which begins with mimicking tapes of past master's voices and tones. Even before they are allowed to work as an assistant, they must learn all the songs. They must also learn the complicated carving techniques. Puppets typically take four days to construct. A strict hierarchy is adhered and even the most talented apprentices must start out as an assistant to the lead puppeteer. Training includes practicing the lines, songs and accumulating hands-on experience. In shadow puppetry there are generally two genres. Dramas performed with songs and poetry are hard to memorize and less popular. Today, audiences prefer the second genre, which features more stunts and demands puppeteers' skills. A senior puppeteer would capture an audience with heartfelt, emotional songs and masterful control of the puppet. Past performances needed at least five people to put on the show, a lead puppeteer, an assistant, the light technician and musicians. Today Fu Hsing Ko's productions need nine people and are much more complex and ambitious. They have also transcended language and cultural barriers and have performed several times in the U.S. and major European cities. Formed in 2002 by the current manager and former apprentice in Fu Hsing Ko, Mr. Chen, Horng Shinq Ger Silhouette Show is a newer, well-known troupe in Kaohsiung. Mr. Chen is a life long puppet fan and wanted to bring about a new vision for the traditional art form. Mr. Chen is an expert in animal mimicry and masterful puppeteer. His puppetry uses puppets as large as a small child and utilizes as many as seven control rods with ten people manipulating them. Mr. Chen wanted to reach out to a younger generation and adopted several new performance styles, which include putting puppeteers and puppets in front of the screen. This also enriched the visual effects and created a new dynamic in the art of lighting and shadows. Mr. Chen has adopted puppet making techniques from China, including more vibrant colors which give greater contrast and depth to the puppets. He also revolutionized the puppets' joints, making it easier to perform swift stunts and creating a three dimensional visual effect. Today, puppeteers are adamant about preserving this traditional art form. Some have revolutionized it by incorporating more modern elements. Kaohsiung is proud of its shadow puppeteers' dedication and passion for the traditional folk art. Each performance pays homage to its rich heritage and tradition. Even today theaters continue to fill up and the art form maintains its traditional glory.